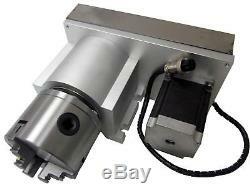 NO VAT CNC 4th Achse Drehachse Rotational Rotary Axis 3 Jaw 80mm Mit Reitstock. 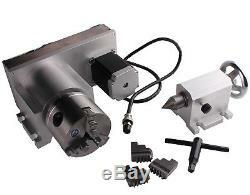 CNC F Style A-Axis, 4th-Axis, Router Rotational Rotary Axis with 3-Jaw 80mm+Tailstock. This item is located in Europe. F Style A-Axis, 4th-Axis, Rotary Axis. Ratio: 1:6(1200 P/R) synchronous pulley induction. 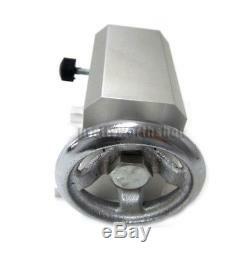 Brand new NEMA23 stepper motor, 1.8degree, 2.2N. 4-pin air plug: 1=A+, 2=A-, 3=B+, 4=B. 3.0 inch rotary handwheel. 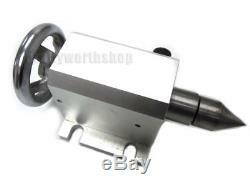 Tailstock stroke limit & position self-lock. Provide it when you order. 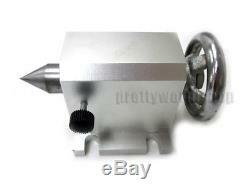 The item "NO VAT CNC 4th Achse Drehachse Rotational Rotary Axis 3 Jaw 80mm Mit Reitstock" is in sale since Monday, February 22, 2016. 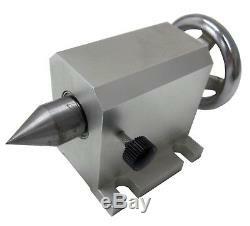 This item is in the category "Business & Industrie\Metallbearbeitung & Schlosserei\Maschinen\Drehmaschinen". The seller is "prettyworthshop" and is located in Jenec.